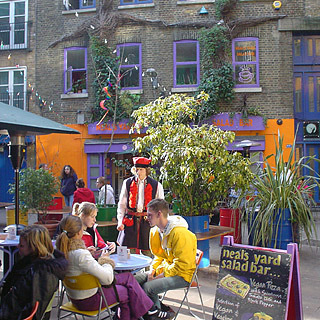 Despite its size, or perhaps because of it, London doesn't have many independent cafes with character. I suggest you start by trying these three, then try the Oxford cafes or Cambridge cafes instead. Failing that, European Cafe Watch has some recommendations for further afield. Monmouth Coffee Company is easily the best place for coffee in London. The coffee selection is probably undisputed gourmet quality, not that I would know, but fortunately the helpful staff are able to make a recommendation if you say things like 'I'd like something smooth and strong, not acidic, that goes well with milk'. Apart from the coffee, the friendly personal service, and the coffee, this cafe has character. It's small, with a few wooden alcoves at the back, where you can squeeze in with the other customers. Perhaps this isn't the place for claustrophobics. However, the real reason that I like Monmouth Coffee Company is that it's a one-off independent cafe in a city that has been carpet-bombed with Starbucks outlets. Peculiarity: the cramped space, which is par for the course, is pleasant rather than irritating. 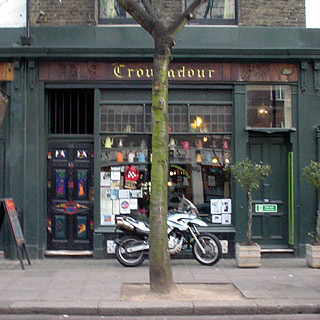 Troubadour is an old cafe, and likes to say so ('since 1954'), which is fair enough given the proliferation of tiny Ikea showroom-style cafes around central London. The decor is olde farmhouse: black-painted wood, cast iron implements and oak beams. This is a good place to sit around in because it has an interesting character. It would have been more relaxing without the loud bassy lounge music, which seems rather out of place. Still, at least it drowns out the traffic noise. Apparently, there is live music in the club downstairs. This trip to London Bridge for lunch turned up another cafe while we were looking for the restaurant (Fish - excellent). 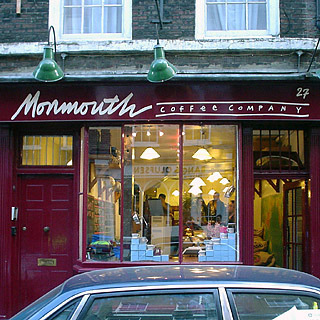 This Monmouth Coffee Company cafe is the big younger sister of an established favourite in Covent Garden. It has marginally more space here, which lets it go beyond pure-play coffee beans and filter coffee, to add a big table for bread and jam, plus assorted other savouries and pastries. 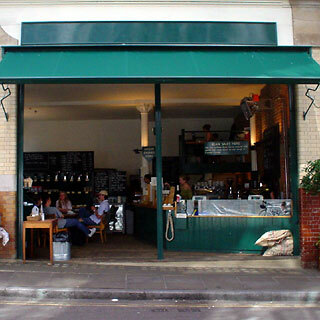 The cafe's summer aspect is a wide-open front that faces Borough Market, which is a completely different feel to the claustrophobic cosiness of the Covent Garden branch, and of most other small London cafes, come to that. What the two cafes have in common is very specific attention to the source of the beans and what happens to them in their quest to become a gorgeous cup of coffee. Also the same is the staff's willingness to explain the different varieties to find out what kind of coffee you want. If, like me, you're less discerning then you're better off just asking for a filter cup of their roast of the week.